Almost all colleges and universities consider course rigor, or course difficulty, as part of the process for assessing candidates who apply for undergraduate admissions. So, when you choose courses in high school, keep in mind that a high level of course rigor will both prepare you to succeed in college as well as position you as a competitive applicant when applying to college. 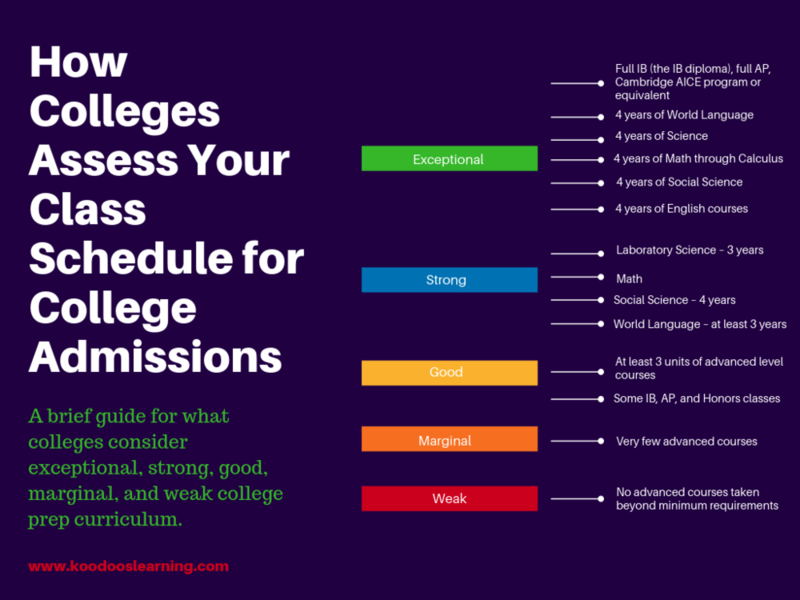 Overall, applicants for admissions at top colleges should strive to complete a somewhat rigorous high school curriculum as it demonstrates to admissions staff that you are willing to put in the effort. Here’s a brief guide for what colleges consider exceptional, strong, good, marginal, and weak college prep curriculum. AP or IB classes in subjects like Computer Science and Statistics are considered rigorous academic electives for the purposes of assessing curriculum quality. An example of an exceptional senior year course load would be Calculus, a Lab Science, a level-4 or above World Language class, Social Studies, and advanced English Composition or Language classes. If you have a job or family responsibilities that prevent you from taking a full and rigorous course load in high school, be sure to note this in your application as colleges acknowledge the need for students to balance life and schoolwork responsibly. In general, keep in mind that your high school record is one of the most important parts of your college application, so it’s important to start early by taking a rigorous course load throughout your high school career.